Washington: Barack Obama was elected the US’ first African-American president, defeating John McCain decisively on Tuesday as citizens surged to the polls in a presidential race that climaxed amid the worst financial crisis since the Great Depression. 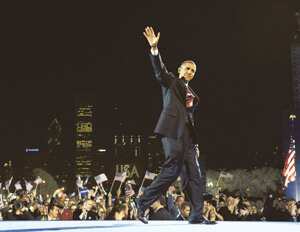 “Change has come," senator Obama told a huge throng of cheering supporters in Chicago at a midnight rally. In his first speech as victor, Obama catalogued the challenges ahead. “The greatest of a lifetime," he said, “two wars, a planet in peril, the worst financial crisis in a century." He added, “There are many who won’t agree with every decision or policy I make as president, and we know that government can’t solve every problem. But I will always be honest with you about the challenges we face." The culmination of the epic two-year campaign marks a historic moment in a nation that since its founding has struggled with racial divisions. It also ushers in a period of dominance for Democrats in Washington for the first time since the early years of president Bill Clinton’s first term. With Tuesday’s elections, Obama’s party will control both houses of Congress as well as the White House, setting the scene for Democrats to push an ambitious agenda from health care to financial regulation to ending the war in Iraq. In becoming the US’ 44th president, Illinois senator Obama, 47 years old, defeated Arizona senator McCain, 72, a veteran lawmaker and Vietnam War hero. Despite a reputation for bucking his own party, McCain could not overcome a Democratic tide, which spurred voters to take a risk on a candidate with less than four years of national political experience. Obama is the first northern Democrat elected president since John F. Kennedy in 1960. McCain conceded the election to Obama, congratulating him and pledging to help bring unity to the country. McCain was defeated in Florida, Ohio, Pennsylvania, New Mexico and New Hampshire, swing states he was hoping to secure for the Republican column. According to a preliminary tally, Obama led the race with 349 electoral votes versus 173 for McCain; 270 were needed to win. Also elected, as vice-president: Joe Biden, the veteran senator from Delaware who has promised to help Obama steer his agenda through Congress. The President-elect will enter office with a long policy wish list that includes ending the war in Iraq, implementing a near-universal health insurance plan and finding alternatives to West Asian oil. All this will have to be carried out amid record budget deficits, a looming crisis in Social Security and Medicare spending as the baby-boom generation retires and fears that the nation is on the edge of a deep recession. Democrats have touted the prospect of a big sweep not just as a partisan conquest but as an ideological turning point, one that could reverse the last great shift in 1980, when Ronald Reagan ushered in a period dominated by tax-cutting conservatism and muscular foreign policy. It’s a startling turnaround from just four years ago, when Republicans controlled Congress and the White House, and benefited from a conservative majority on the Supreme Court. The party’s intellectual leaders spoke of a permanent Republican majority in Washington. What remains unclear, however, is whether Tuesday’s results represent a vote for liberalism or against the failures of the Bush administration, including the early war years in Iraq, the calamity of Hurricane Katrina and the current economic slump. The transition to an Obama administration could begin almost immediately. A shadow treasury team could be in place by the end of the week, aides say. In many ways, the transition has already started. John Podesta, a former White House chief of staff under president Clinton, has been leading quiet conversations about key positions, especially those relating to the economy. National exit poll results found Obama increasing his vote percentages across the board, with particular success coming from the youth and black votes, as many in his campaign had predicted. Although a preliminary figure, his 52% of the popular vote marks the first time since Johnson that a Democrat had clearly won more than half the nation’s vote. Obama scored with 96% of black voters, who increased their share of the electorate to 13% from 11%. Senator John Kerry of Massachusetts won 88% of the black vote in 2004. Obama won two-thirds of Hispanics and more than two-thirds of voters aged 18 to 29. Obama’s campaign organization reached corners of the country largely untouched by previous Democratic candidates. Democrats also bolstered their majorities on Capitol Hill. The party secured a number of Senate victories, bringing it teasingly close to a filibuster-proof margin. Party leaders will likely be able to make up the one or two additional votes with moderate Republicans. The party picked up at least 10 House seats, a number expected to grow significantly. In Arizona, McCain offered congratulations to his opponent and spoke of the historic moment and the importance of the day to African-Americans. The Arizona senator also pledged to put the bitterness of the campaign aside and to work with the new president through the difficult times facing the nation. McCain phoned Obama to concede the race and both men pledged to work together. Obama declared victory in Chicago’s Grant Park in front of an audience of 125,000 people, saying, “If there is anyone out there who still doubts America is a place where all things are possible, who still wonders if the dream of our founders are alive in our time, who still questions the power of our democracy, tonight is your answer." The 2008 election, the longest and most expensive presidential campaign in US history, was a watershed in many ways. It featured the first woman—New York senator Hillary Clinton—to seriously contend for a party nomination. Governor Sarah Palin of Alaska became the first woman to appear on the Republican ticket. And Obama broke ground as the first black party nominee for president. “Obama is documentation of America’s moral progress, the moral evolution we have gone through in the past 40 years," said Shelby Steele, a black writer and a fellow at Stanford’s Hoover Institution, who voted for McCain. “Whites don’t get credit for it. But having grown up myself in segregation—America has changed enormously." The candidates spent about $1.6 billion on the election, double the 2004 presidential race, according to the Center for Responsive Politics. When all is tallied, Obama is expected to have raised around $700 million, a sum made possible when he opted to forgo public financing, the first candidate to do so since the system was implemented in the wake of the Watergate scandal. That decision, and the resulting bonanza, is likely to change how future campaigns are funded. Indications from early voting and lengthy lines at the polls point to the biggest voter turnout since women got the vote in 1920. In total, voter registration numbers were up 7.3% compared with the last presidential election, for a total of 153 million eligible voters. The race also featured the most extensive use yet of the Internet. Online social networks spread the campaign to corners of the country that had never before experienced such intense electioneering. Many African-Americans were celebrating how far a black man had come. “It’s a feeling we feel all the way inside—Lord, we’re finally overcoming," said Willie Smiley, 65, a retired government worker from Detroit. Benjamin T. Jealous, president and CEO of the NAACP, the nation’s oldest civil-rights group, said his 92-year-old grandmother, whose grandfather was a slave, is “giddy" at the prospect of seeing young black girls holding pyjama parties at the White House. “At this moment, it feels as if anything is possible, and that is the way it needs to be in this country," he said in an interview on Tuesday. Obama launched his candidacy on the state house steps of Springfield, Illinois, nearly two years ago. He was a freshman senator, largely unknown, noted mostly for a keynote speech at the 2004 Democratic Convention and a best-selling book. The son of a white woman from Kansas and a Kenyan immigrant who once herded goats, the relative newcomer came with a foreign-sounding name and associations that would prove to be liabilities. His spiritual adviser, the Reverend Jeremiah Wright, had issued incendiary sermons from the pulpit of Obama’s church. A convicted felon, Tony Rezko, helped him purchase a Chicago home. And Republicans tried to tie Obama to an associate and neighbour, William Ayers, a member of a domestic terrorist organization in the 1960s. With that baggage, he took on one of the most powerful names in Democratic politics, Hillary Clinton, defeating her after an epic primary fight. Obama’s campaign beat the formidable Clinton machine by going where she was not, racking up victories in states such as Idaho, Kansas and Wyoming. In the general election campaign, Obama held the lead for most of the summer. Following back-to-back conventions, McCain briefly pulled ahead after he energized his party by choosing Palin as his running mate. When the financial crisis hit, causing stocks to plummet and the government to embark on a series of unprecedented interventions in markets, voters were reminded of their economic concerns and Obama pulled ahead again. He never lost the lead. During the primaries, McCain’s campaign was large and expensive and nearly collapsed. He began again with a bare-bones operation, running as a promoter of the war in Iraq at a time when it was deeply unpopular. He pushed for and then backed the early 2007 surge in troops that turned out to be an important factor in the country’s turnaround. After winning the nomination, McCain still had work to do with the conservative base of his party. Many in the base were angered by his push to change the nation’s immigration laws and campaign-finance rules, his support for embryonic stem cell research and his opposition to the Bush tax cuts. He struggled to find a message that would resonate, running at various times as the experienced insider, a maverick who would shake up Washington, a bipartisan conciliator, a tax-cutting conservative and a tough-minded “Country First" war hero. The choice of Palin thrilled conservatives but turned off other voters, especially independents. Early exit polls Tuesday found that six in 10 voters said she isn’t qualified to be president. Those voters overwhelmingly favoured Obama. McCain’s campaign received a jolt in October when taxes became a hot issue, but it was never enough to overcome Obama’s optimistic, though vague, slogan of hope, which appealed to an electorate angry over war, the economy and President Bush, who has one of the lowest approval ratings on record. According to early exit poll data, 62% of voters said the economy was their top concern. All other issues, including terrorism and the war in Iraq, were far behind. In 2004, terrorism and the economy were tied at about 20%. Obama’s promises will be challenges to keep in the face of a likely recession, two wars and record budget deficits. He has promised to end the war in Iraq and reduce troop levels quickly. He has also vowed to redouble efforts to stabilize Afghanistan, beef up the US military presence there and to reinvigorate efforts against Al Qaeda, both in Afghanistan and Pakistan. He promised to create a new government-organized health care marketplace and cut taxes for every family earning less than $200,000 and raise them for families over $250,000. He has vowed to wean the country of West Asian oil over 10 years, dedicating $150 billion to alternative and renewable energy research and development, likening the challenge to that of putting a man on the moon. He has said he will cap greenhouse-gas emissions and force polluters to begin paying for emission permits in order to tackle global warming. He has also promised billions of federal dollars for education, teacher training and recruitment. College applicants would be given tax incentives to offset tuition in exchange for national service. In the short run, Obama has promised to prime the flagging economy with billions of dollars for infrastructure, unemployment insurance and Medicaid. Banks would have to temporarily halt home foreclosures in exchange for government assistance. The incoming president will have some advantages, including the apparent enthusiastic backing of voters. A Wall Street Journal/NBC News poll released Monday found that 81% of Obama supporters said their vote was for him, not against McCain. Exit polls found 56% of voters were either optimistic or excited about what Obama would do as president. And two-thirds of voters in the Journal poll said they understand Obama’s message and know what he will do as president, just shy of the 72% who said that about President Bush when he stood for re-election in 2004. With strong majorities in Congress, President-elect Obama is likely to start fast, with a large economic-stimulus package, legislation to fund embryonic stem-cell research and an expansion of the State Children’s Health Insurance Program, a government insurance programme which will be financed with a rise in the tobacco tax. After that, Democrats are divided over how to proceed. Old-guard liberals want to move as fast as possible while they have solid majorities and an electoral mandate. Conservative Democrats want more attention paid to a federal budget deficit that could approach $1 trillion this fiscal year. Democratic leaders in Congress, mindful of Bill Clinton’s health-care debacle of 1993 and the Republican resurgence that swept them from power the next year, counsel a cautious approach that builds bipartisan and voter support before moving on the President-elect’s big-ticket items. The President-elect will not have much time to decide. By early February, he will have to produce a budget that lays out his spending and tax priorities at least over the next five years and hints at what he will do to confront the looming costs of Social Security and Medicare. Elizabeth Holmes, Amy Chozick, Stephanie Simon, Paulo Prada and Christopher Cooper contributed to this story.